Hard to put an exact definition on it and full of its own contradictions, not to mention definitions applied and reapplied and adapted. It can be difficult for the curious (quilter or not) to really figure out what modern quilting is to the community. Quilting With a Modern Slant doesn't necessarily define it either. But what it does is share a group of quilters who lead and inspire quilters. It profiles 70 quilters and their patterns/techniques that inspire modern quilters. Some may be modern quilters themselves, some may identify differently. It frankly doesn't matter really. 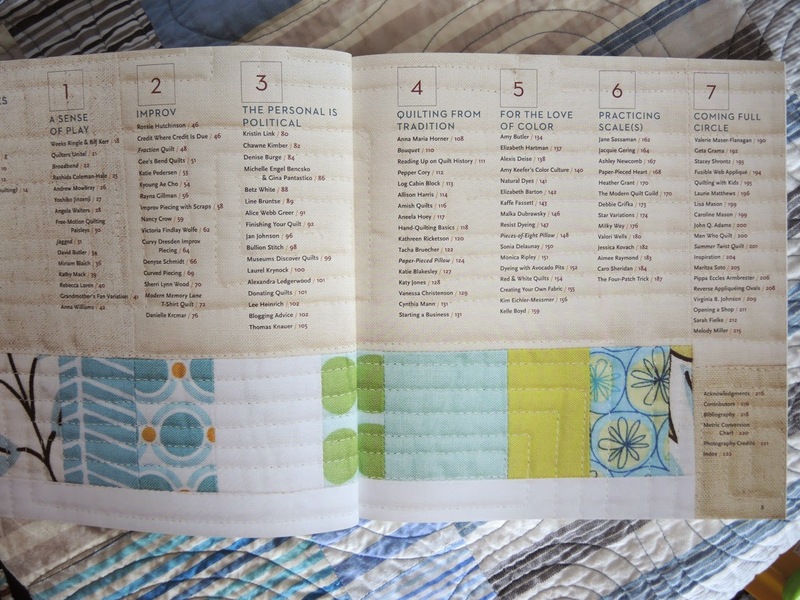 The book is chock full of inspiration for nearly any quilter. Interspersed within the profiles are a handful of patterns as well as some basic quilting info. If you are the Yay! kind of quilter then this book will be an excellent introduction to quilters you may not know, not to mention the eye candy. If you asked Huh? 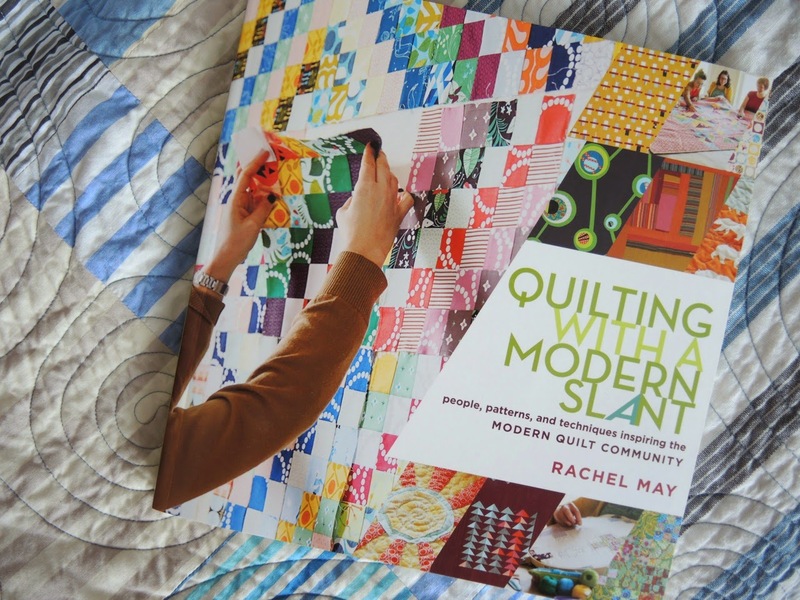 when modern quilting is mentioned this book will serve as a great peek into the community. Of course there are a million more quilters doing a lot more things, but you can't get them all in a book. And while it won't define modern quilting for you, it will help with the 'knowing it when you see it' response. For the non quilters who come across this book I think it serves an excellent introduction to the craft and the community. In fact, if this had been offered as more of a coffee table book and the profiles expanded a little bit more then the audience would have been wider. But with the emphasis on the profiles and quilts, and quilting info running like a television ticker on the bottom of the page, it would have been great as a solid resource as opposed to a soft cover. If you answered Ugh. when asked about modern quilting then I wouldn't dismiss this book either. It would do well as way in to the community or at least trying to understand the aesthetic. I have books on Baltimore Album quilts and art quilting because I believe in learning about the tradition and craft, regardless of my personal tastes in making. If you feel this way too, or are open to exploration, then this book would be a good start. Rachel May is based in Boston and is one of the founders of the Modern Quilt Guild there. She clearly knows a lot of people in the community and worked to follow and discover more. She's compiled a pretty extensive list of artists. Most were familiar to me, but there were certainly some new artists that got me pretty excited. My one complaint about the book is that the profiles are pretty lean in most cases. Now I can appreciate that the choice was likely made to have more quilters over more detailed profiles, but I would have liked to learn a bit more about people. If you follow some via their blogs then this book doesn't really provide anything you don't already know. Then again, not everyone reads blogs. I do have one mention in the book (I am not profiled). Rossie Hutchinson included a pattern for her Fraction Quilt, which was, in turn, inspired by a quilt I made called Your Parents Are Cool. Her profile in fact focuses on the importance of identifying and sharing your inspiration. With so much eye candy in the book, there may be people sourcing the book a lot in the future. Full Disclosure: Storey Publishing provided a copy of the book for review. And Rossie was kind enough to share a copy as well. And I, in turn, shared one with a friend. That is a great book review, Cheryl!! I have the book and really love it. I couldn't agree more with eveything you said. I was lucky enough to get that book from our local library! Whohoo! Great book review. I will have to look for it.